Although our gardens appear bare and dead once the leaves start falling off the trees in late autumn, there is in fact plenty of opportunity for life out there, even in the bleakest of weather conditions. Planting bulbs in winter is like leaving buried treasure in the garden which lies dormant until sprouting in early spring. Certain vegetables can be planted and harvested in winter, and some even thrive in the cold conditions. There are some precautions which you can take to protect certain vegetables from the frost, such as planting or sowing in a greenhouse or polytunnel or covering seedlings planted outside with glass cloches, horticultural fleece or perforated polythene. Planting in winter can provide you with salad leaves throughout the colder months and means you will get some fresh air and exercise – you aren’t banished from the garden for six months of the year! Winter is also the prime time to prepare your garden so that it comes alive the following spring and summer. Here are some of the plants and vegetables which can be planted in the cold season. 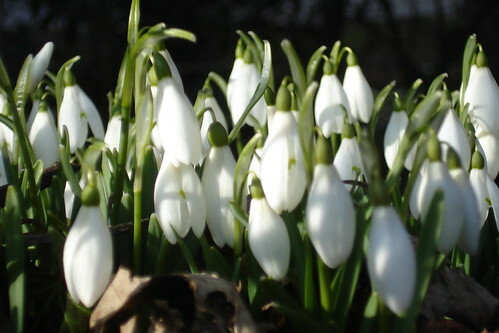 The snowdrop, that most delicate and beautiful of flowers, appears as if out of nowhere in early spring. These hardly little flowers, known by the Latin name ‘Galanthus’, sprout in late winter or early spring, even through the snow. Plant them from October to December, before the first frost, in a spot which gets dappled shade- they like being at the foot of trees. Then wait for them to appear, the first signs of life after a barren winter. ‘Valdor’ Lettuce: this hardy, dark green lettuce should be sown by the end of October and will be ready for picking 2 ½ -3 months later. This lettuce is one amongst many salad plants which make it possible to continue eating home-grown produce from your garden right through the winter. ‘Arctic King’ Lettuce: sow this crunchy, light green lettuce in early winter. It is exceptionally resistant to the cold but will benefit from being protected by a cloche during periods of extreme frost. Alternatively, plant in a greenhouse to ensure survival. This hardy winter vegetable will survive the frost and in fact requires a frosty period in order to grow better stalks. Once planted in late autumn to early winter they require very little attention and should be ready for harvesting around May, unless you force them. Buy ‘crowns’, one year old plants, rather than seeds which take a year longer to produce stalks and can’t always be relied on to grow into a healthy plant. Plant your crowns in an area with plenty of space (they can grow to be enormous), having cultivated the soil and removed any stones four weeks previously. Plant the crowns with their tops level with the surface of the soil. Be aware that rhubarb leaves contain the poisonous substance oxalic acid and are not safe for human consumption. If you want your garden to bloom with beautiful, bold colors come spring, winter is the time to plant all flowers which sprout from a bulb. As long as you start with a good quality, healthy bulb which hasn’t dried out at all, they are very easy to look after and require practically no attention after planting. Make sure, though, that they have some sunshine and well-drained soil. Plant them around two bulb widths apart and two to three bulbs deep in the soil, with the top of the bulb facing upwards. Plant garlic in October and November in the warmest part of the garden and they will be ready to harvest the following summer. The general rule is that they should be planted before Christmas. To plant, split the bulb into individual cloves and place them in rows just below the soil surface. The cloves should be around 6 inches apart and the rows 12 inches apart. To prevent your garlic, and any other seeds and bulbs you plant, from becoming rich pickings for squirrels and birds, cover them with horticultural fleece or wire mesh. If you plan ahead and look after the vegetables and plants you sow in winter, your garden will reward you with delicious produce throughout the colder months and bountiful, beautiful plants and crops come spring and summer. My name is Ricky, I work at Swallow Aquatics, (we sell pond supplies like filters, liners etc) I love my garden, it’s small, but well loved! I also love reading and writing about gardening and I like nothing more than a winter stew full of home grown veggies!